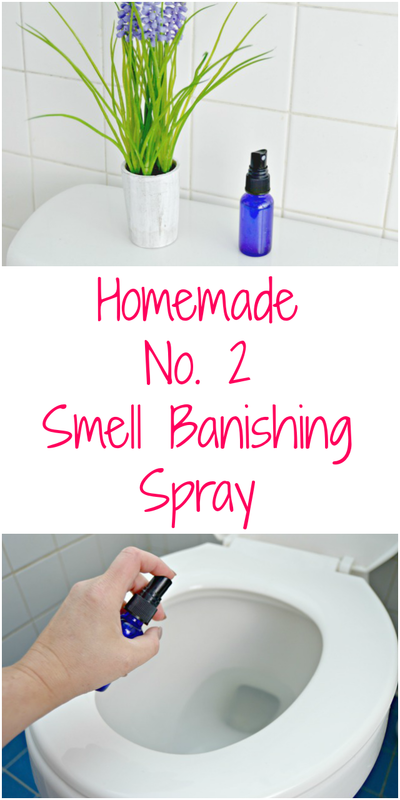 This Homemade Poo Pourri Like Spray recipe is amazing, and the key to neutralizing bathroom stink no matter where you are and have to go No. 2. Because you know…we all want to keep potty business private, right? Y’all remember that episode of Oprah where she and Dr. Oz talked about well…poop? Gah…I can’t believe I even typed that word. But, we are going to take a minute and just talk about it. While it is something everybody does, it’s not necessarily something that you want to share with the rest of the world, right? So here’s the thing…we all have to go, and sometimes we have to go right away, no matter where we are. But, we don’t actually want to share the smell, ya know? I’ve heard about this crazy stuff called Poo Pourri for the past couple of years, and I’ve even seen it in some specialty stores, but I had no idea how it works. The world definitely doesn’t need one more odor masker. The good news is that Poo Pourri Like Spray works differently, and it actually does work! This post contains affiliate links, which means if your purchase through these links I will receive a small commission. These items can usually be found in the pharmacy section of your grocery store or natural food stores, I’m including links to purchase in case you can’t find them or your enjoy shopping from home like me! 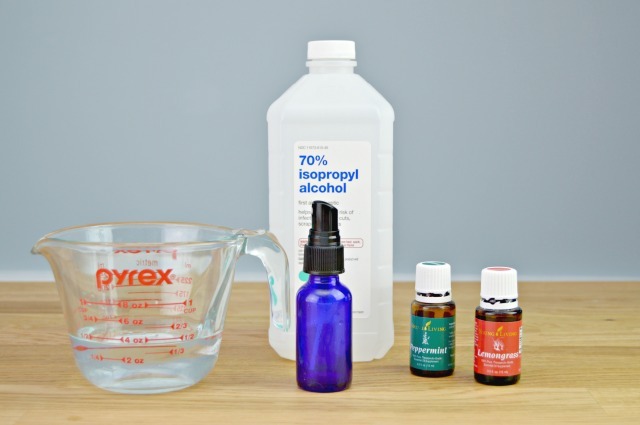 Here is a short video showing how easy it is to make your own Poo Pourri Like Spray… or you can skip ahead to the photos. Read on for the photos and how to use Poo Pourri Like Spray! Add 1 teaspoon of isopropyl alcohol, 15 drops of Peppermint Essential Oil and 15 drops of Lemongrass Essential Oil to your spray bottle. Now fill the rest of the bottle with distilled water. Distilled water helps to prolong the shelf life of homemade cleaners and concoctions. 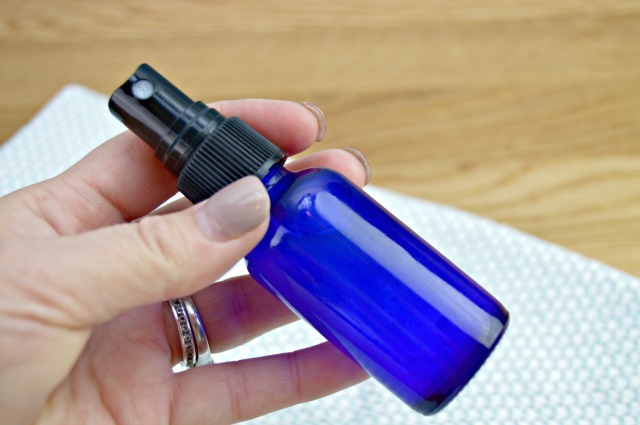 Now…on to how to use your homemade poo pourri like spray. 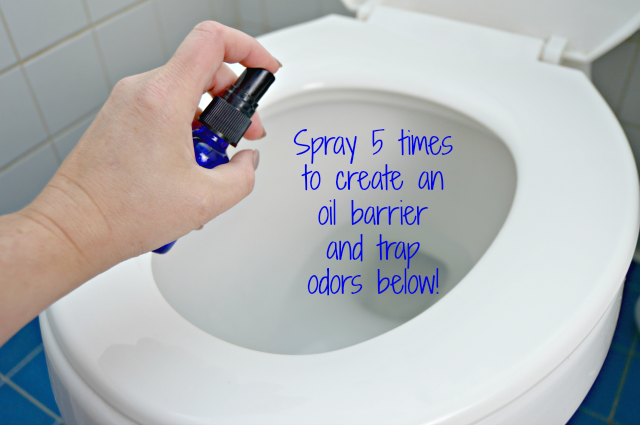 The trick is to spray this stuff into your toilet bowl, directly into the water BEFORE you go. Spray it 5 times, right into the water. The oil and alcohol create an oil barrier on top of the water to trap any “poo” under it! This traps the odors underneath the oil barrier so they don’t come out of the toilet and into the air. Woo to the hoo…no tell-tell No. 2 smell! Just flush the toilet, and no one will be the wiser! I keep a bottle of Poo Pourri Like Spray in each of our bathrooms and one in my purse just in case too! Now, let’s just conclude the potty talk shall we? 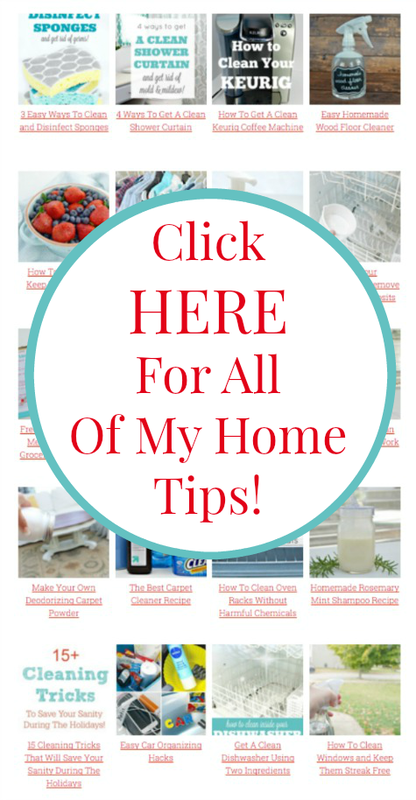 You can find all of my easy Cleaning Hacks and Home Tips HERE on my Home Tips Page! Can you use something other then lemongrass?? I’m allergic to it…. Absolutely, Fran! Use any essential oils you like! I made this today, it really works. I think I will have to make a larger bottle. So, I’m guessing I’ll double the receipt. Can i change the Isopropyl Alcohol and use Hydrogen Peroxide instead? If can, is the measurement still the same? What about Witch Hazel in place of the alcohol? I don’t think it will work as well, but you can definitely give it a try! You can use witch-hazel instead. This is a great idea! Do you think the Alcohol would clean or santize the toilet seat too? Will it work as well if I used vodka instead of alcohol. Soo can someone please tell me where can I get isopropyl alcohol from in the UK? Does it have another name? If you mean drinking heavily to numb the pain of bathroom odors, then yeah, maybe. Can I use this if I have a septic tank? Do the bottles need to be glass or can they be plastic? Wondering if plastic is okay with the essential oils. Thanks! I started making my own about two years ago when I discovered your site. My bonus daughter bought her daddy and I a few bottles as Christmas gifts a few years ago but I hated the smell but the label were very pretty so I poured out the contents, cleaned the bottles and followed your recipe. I’m not crazy about lemongrass so I use just lemon oil but I’ve also made it with lavender and peppermint and a few other blends. I love this stuff and it really works well. I have also used them as stocking stuffers and just small “add-on” gifts. Thanks so much for all your great ideas. Can you just use tap water instead of distilled? Oh, nevermind. I just saw the part about prolonging the life of the spray. How did I miss that before? Thanks anyway. do you have printable poo spray labels to print? Hi! Some recipes say to add a tsp of gliceryne. I wonder have you yried to do this as well?